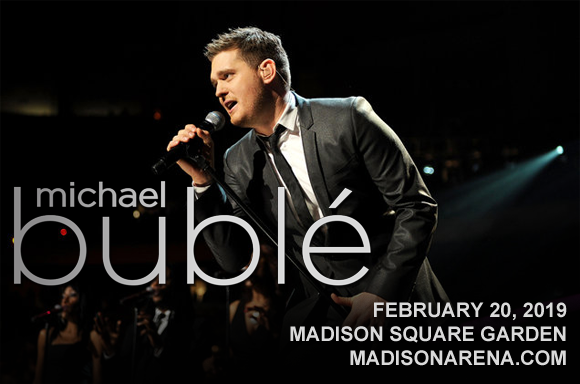 Charismatic crooner Michael Buble brings his silky-smooth voice to Madison Square Garden on Wednesday 20th February 2019 as part of his first outing on the road in two years! Bringing an air of joy and romance with him, Buble will be performing as part of his Love Tour, promoting his album of the same name! Not only that, but the chart-topper will also be performing a handful of beloved Buble hits, guaranteed to get everybody singing along! Four-time Grammy Award-winning, thirteen-time Juno Award winning light jazz crooner Michael Buble began his showbiz career singing in nightclubs as a teen. After several unexpected opportunities (including becoming a regular on Canadian talk show host Vicki Gabereau's show after filling in for another artist and singing at the wedding of then Prime Minister McSweeney's daughter), Buble signed with multi-Grammy Award-winning producer David Foster's label, 143 Records. His self-titled studio debut came in 2003, leading the way for three consecutive number one albums. To date, Buble has released eight studio albums, including his most recent, Love (2018). Throughout his career, he has sold over 75 million records worldwide.